I love to try things and I love a lot of different things and thought it would be fun to share them sometimes in some posts dedicated to "Things I Am Loving This Week." Mostly, but not exclusively food related, the "things" might be products I have tried and loved, or things I think are unique and fun, maybe even another blog or post I enjoyed reading--who knows!?! Basically just a few things that make me happy and I think are worth sharing for the week. Can you believe I didn't use to like honey, either the taste or the smell?! I don't know why or what made me change my mind (maybe good honey?) but now I love it and really like things with honey in them. 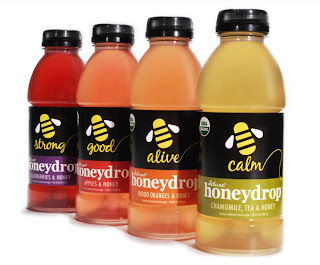 My Whole Foods started carrying these Deluxe Honeydrop bottled drinks. (I think they came out last fall but it takes us a while to get stuff here). I tried the "Bee Strong" which is organic blueberries and honey and loved it, going back to pick up the other flavors; "Be Calm"--Chamomile and Honey, "Be Good"--Apples and Honey and "Be Alive"--Blood Orange and Honey. I think the blueberries and blood orange flavors are my favorites but all are good and they are made with purified water, organic honey and fruit juices with natural flavors. Honey is reported to have multiple health benefits and these taste good enough that they work for me as an occasional treat that cures a sweet fix for about 80 calories a bottle and no artificial sweeteners. I know that to be more "green", I am not supposed to use dryer sheets and instead use those dryer balls or tennis balls to soften towels and sheets and things. Better yet, I should be air drying them BUT sometimes I just want to pull soft, lightly scented sheets out of my dryer and put them on my bed. 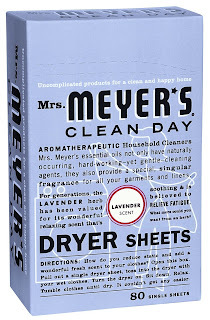 I finally tried Mrs. Meyer's Clean Day Lavender Dryer Sheets last night and I LOVE them. They are biodegradable and made with essential oils and better for the earth ingredients. Although I will need to do more "testing" to make sure it wasn't a fluke how wrinkle-free they were, I had very smooth, soft sheets with just a touch of yummy lavender scent to sleep on last night. Another thing I really love is getting to know fellow food bloggers. I finally got a chance to meet and hang out with the wonderful Kat from Our Adventures in Japan. Kat's blog is one I started reading "BB" (That's before blogging) and I stop by frequently to check out the wonderful food she has eaten or cooked and the beautiful photos of the places she goes in Japan. Originally from Hawaii, she is here visiting for a few weeks and we got to hang out twice. The first time we met for an Acai Bowl (if you aren't familiar with Acai Bowls, read this post), and some conversation at Blue Hawaii Lifestyle in Ala Moana Mall, along with another great Hawaii blogger Alan from Ma'ona. After our bowls and some good foodie chat, Alan had to get back to work so Kat and I ventured up to The Pacific Place Tea Garden to continue our conversation over iced tea and macarons. This little kiosk style tea place in the middle of the mall is a great spot to people watch. Since we were full from our Acai bowls, I opted to forgo my usual tea-sorbet float (yet another thing I love!) and just have the tangerine-ginger tea and a chocolate macaron and Kat went with their passion fruit blend and a green tea macaroon. Deciding there was more food to eat and conversation to have, the following week Kat and I met again to try Hank's Haute Dogs, a local place that just got named one of "The Hot 10: Best New Places for Hotdogs" in August's Bon Appetit. (Yes, I love it when a little Hawaii place gets written up in a National magazine too). I had eaten at Hanks a couple of times when it first opened but it had been awhile (I try to make hot dogs only an occasional thing) and this was Kat's first visit, so we felt obligated to try it very thoroughly. ;-) We split the artery-hardening "Fat Boy" or an HDBLT; a bacon-wrapped, deep-fried hot dog in a bun with lettuce, tomato and mayo and the daily "haute" dog special, a "Buffalo Brat" with brown ale and chipotle-pineapple relish, cabbage and Guinness mustard. Of course we needed to sample the fries, onion rings and a couple dipping sauces; Garlic Aoili and Curry Ketchup and some Lilikoi Lime Punch too. I love a good giveaway and I am happy to announce the winner of the Betty Crocker Gluten Free Dessert Mix Giveaway. Thanks to everyone who entered. "My parents made all of our cakes growing up, and iced them with Mom's "secret" recipe icing. When my dad passed away suddenly (he was the "cake decorator") my sister and I decided to take the Wilton cake decorating classes and carry on the tradition of homemade cakes. (We both now teach the Wilton courses) My family LOVES our cakes, but unfortunately my brother and one of his sons was recently diagnosed with Celiac Disease. I have not been able to find a yummy yellow gluten-free recipe (yellow is their favorite) to pair with our special frosting. I would LOVE to win this and be able to surprise them with a cake iced in Mom's frosting that they can actually eat! You should see the sad looks on their faces at birthdays and graduation parties when the cake is being served :( . In fact, today is my brother's 49th birthday, and I promised him that by next year, the big 5-0 I would find a delicious yellow cake that he could eat! Talk about a sign! It would be great to try them all and pass along the info to my students as well! Thanks for your consideration." Congratulations Sharyn! Please email me at my email address on the sidebar with your address and I'll have the prize pack sent to you. Happy Monday--have a wonderful week! I think that *good* honey makes all the difference. My favorite comes from near Seattle. We actually had some shipped to us in KY after visiting there. The drinks sound great! I love acai and have been craving it like crazy lately. It is called acai na tigela here. Do they blend it with sugar and guarana syrup in Hawaii? congratulations to sharyn :) what a great giveaway! thanks for making my vacation a delicious one!! see you next year. Deb, I am so happy Sharyn won the give-away. It was meant to be. You know what they say, "the Lord works in mysterious ways." Her comment put a lump in my throat. As for the dryer sheets, I've got to find me some of those. You have the coolest stuff down there! I love those drinks, they would be perfect for lunches. And I have always wanted to try an acai bowl... ok, always since you mentioned them! Good honey is sooooo good! I haven't seen those drinks before, but they look fun! Loved seeing the pics of your outings. Congrats to Sharyn. Sounds like her family will really enjoy the cakes. Lori--I am loving the honey I get from The Big Island right now. Here, most places use Acai from a company called Sambazon and it has cane juice and the guarana mixed in. Chow and Chatter--it is so fun to hang out with other bloggers. Kat--looking forward to your next visit! Teresa--I hope you find the dryer sheets--they are so nice. Natashya--I would think they would have them somewhere up there in a smoothie shop. Our natural foods stores and some groceries have the Acai frozen in packets so I make them at home sometimes too. Kim--thanks! it was a fun couple of days. Kat--I have tried the dish soap but will put the iron spray on my "to-try" list! I love how happy this post is. It's so good to stop and think about the things that you appreciate. Thank you for sharing this with us..what a fun post! You know, my daughter doesn't like honey and I can't figure out why (she likes almost everything!!). Congrats to your winner! Congrats to Sharyn. Now, do you think she would be willing to share her secret icing? I just tried the Betty Crocker chocolate chip cookies for my celiac husband and he heartily approves! Congrats to Sharon - I hope her brother enjoys eating those goodies! Those honeydrop drinks sound so yummy. How fun to meet fellow bloggers!